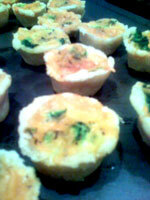 Mini quiches are a classic part food. They are quintessentially French and really easy to eat. They can be made ahead and reheated quickly on a cookie sheet at 350 degrees. Though it would be very easy to buy these in the freezer section, when you make them yourself they are truly exceptionally. These were a huge hit with the father to be. In a large metal bowl, mix all ingredients, except the water with a fork or pastry cutter. The goal is to incorporate the butter until it is the texture of course meal. Slowly sprinkle in the water and quickly mix. Making sure not to put in too much water, briefly kneed the pastry so that it forms a cohesive ball. Pull out about 1 tablespoon of dough and flatten into a round, place it into a mini-muffin pan to form a miniature pie shell. Preheat the oven to 350 degrease. Beat the eggs, milk, mustard and seasonings with a whisk until well combined. Fill half of the pastry with broccoli and the other half with cheese. For the broccoli quiches, top them with a bit of the cheese. 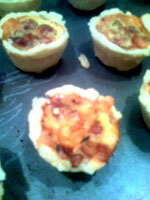 For the cheese quiches, top them with a bit of the bacon bits. 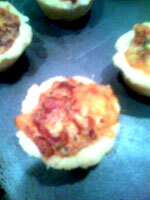 Slowly fill the mini pies with the egg mixture until you can see the egg peaking out of the filling. Place the molds on top of a baking sheet and bake the pans for 30 minutes or until the tops turn golden brown. Serve hot or at room temperature.